This Vegan Green Bean Casserole takes only 40 minutes! 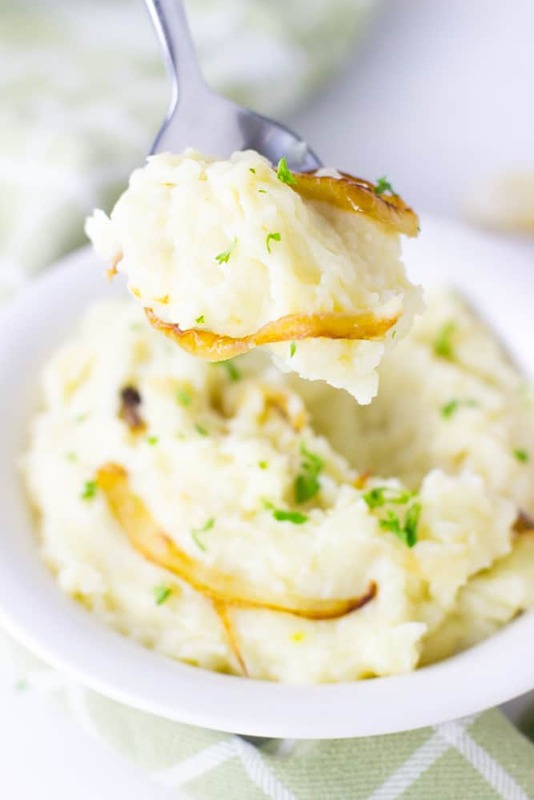 It’s easy, creamy, completely delicious and gluten free! Happy Canadian Thanksgiving!! I hope you guys are eating lots of yummy food today! 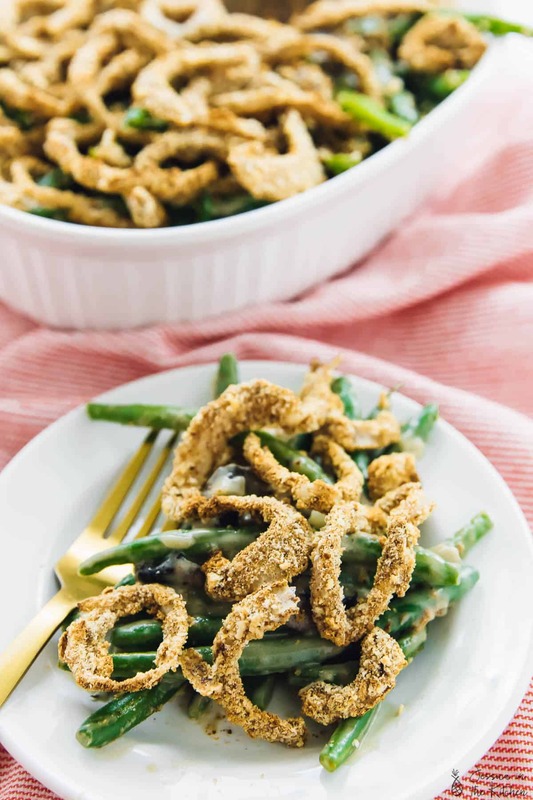 This recipe seems to be perfectly timely, since while I love green beans all year round, this Green Bean Casserole is definitely going to need a spot at your Thanksgiving day (American or Canadian, I’m generous friends). You guys have been asking me to remake classic Thanksgiving recipes, so of course I’ve been working hard to do that. Eating all the things. Today I remade a classic green bean casserole, veganised, made it gluten free, and obvi keep it so delicious for you. Oh yeah, I made those baked onion rings for you so that you can make them ALL the time. This is a dangerous trick to know. Before making this, I’ve had green bean casserole versions in Whole Foods and I’ve always enjoyed them. 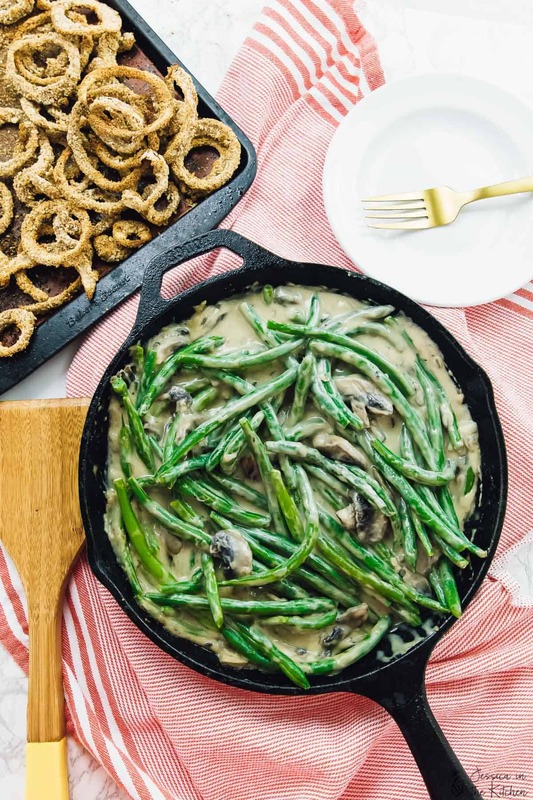 I’m personally a huge fan of a crispier green bean casserole – making it on a stove top, so that the beans are dunked in that swoon-worthy sauce but never mushy. That crisp really resonates with me. While we were making this, I kept eating the greens plain, just blanched, straight from the colander. The Mr. gave me a lot of weird looks. What can I say? Some days I like to devour plain green beans, other days I like to eat a whole, er, slice of chocolate cake. Balance, friends. 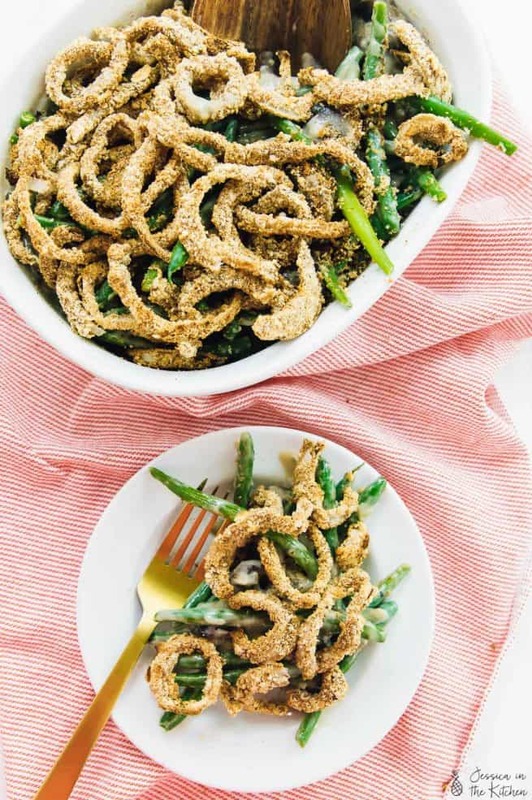 This green bean casserole elicits true balance. On one hand, that sauce is so creamy. Those onion rings are heavenly and you will, 100%, eat them from the pan and end up with less for your casserole so please make extra. Speaking from experience here people. On the other hand, the onion rings are baked, not fried, and the casserole sauce uses healthier ingredients. You get to indulge without any insane guilt. It’s pretty perfect, right? I couldn’t choose a favourite part of this casserole – I love every single bit, and they all come together beautifully. The mushrooms in the casserole that add a meaty touch. 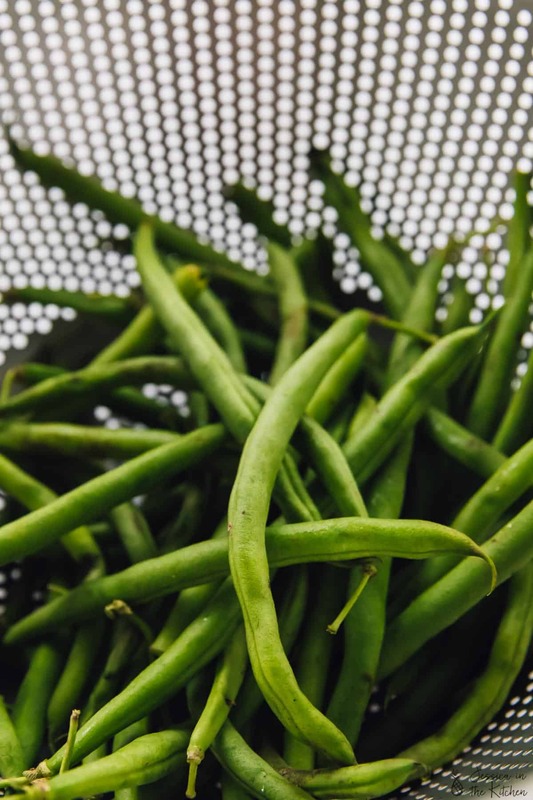 The crisp, green beans that brighten it up and taste fresh and delicious. That SAUCE tho. A silky combination of roasted garlic (PRO tip: always have some in the fridge), coconut milk, vegan butter and gf flour. Also well, of course, those onion rings. THOSE onion rings. You can always buy onion rings, I’ll be honest. But the satisfaction that comes from making onion rings from scratch cannot be beat friends. The best part is that it is as easy as battering, and baking. Simple. 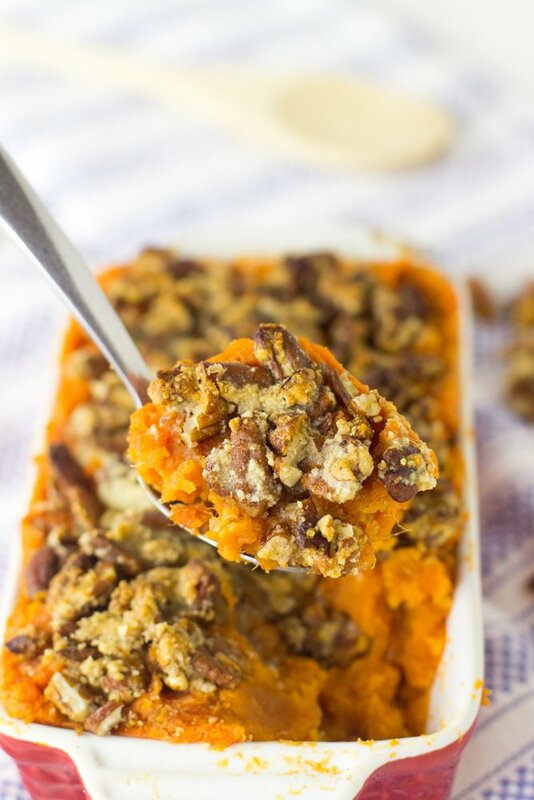 I promise you will love this casserole. It’s a green bean casserole made from scratch, in 40 minutes, with all the fixings, that you’ll be looking forward to having as leftovers. Enjoy, friends! 1 very large white onion, thinly sliced. Preheat the oven to 450F degrees. While the onion rings are baking, prepare the rest of the dish. 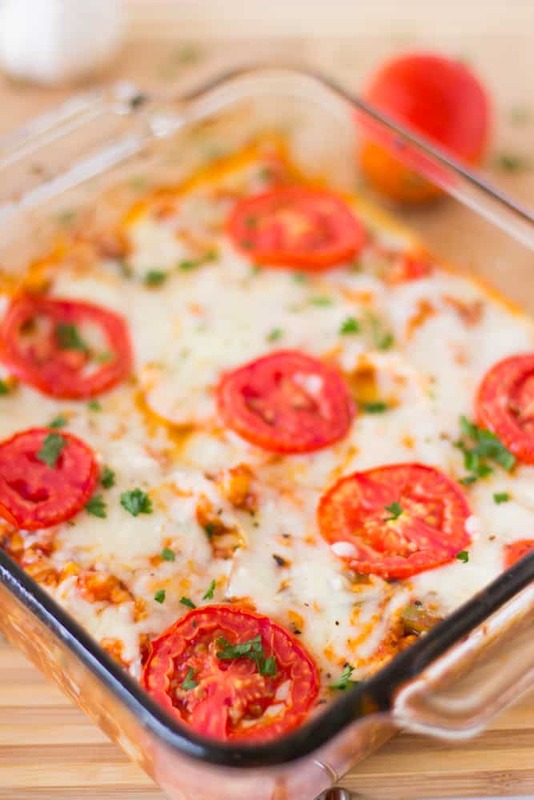 Prepare a baking dish with a silicone mat and set aside. Combine the flour, salt, pepper and paprika in a bowl large enough to dip the onions into. In another similar size bowl combine the flax eggs and the milk. Whisk together. Place the breadcrumbs in its own bowl. Line up the bowls: flour, flax egg, breadcrumbs. Dip an onion ring into the seasoned flour, then the onion into the flax egg batter. Shake the excess liquid off. Dip in the breadcrumbs and place on the baking sheet. Repeat with the rest of the onions until finished. Place onion rings into the oven for 18 minutes, flipping each ring halfway. Remove from oven when finished and allow to cool slightly. 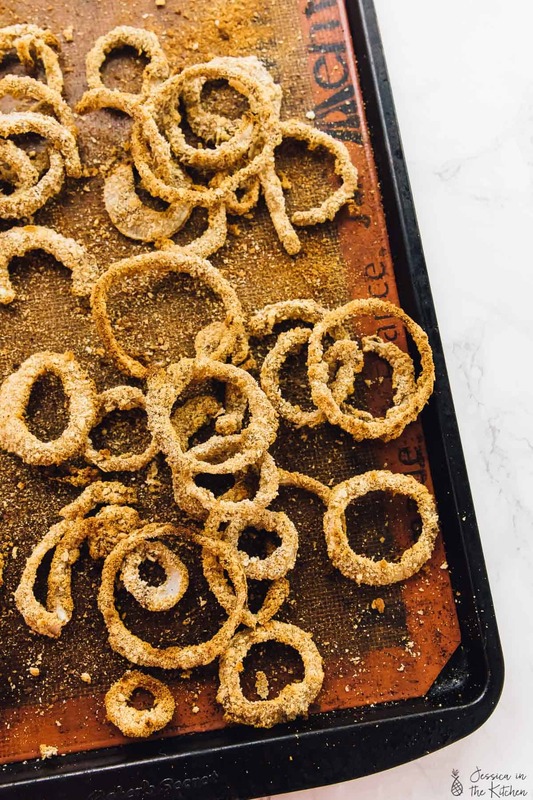 The onion rings will stay crispy once kept on the baking sheet. Bring a pot of salted water to a boil. Add the green beans, blanch for 2-3 minutes, then remove. Pour into a colander or strainer in your sink, and pour cold water over the top to stop the cooking process. This will cook the beans, as well as brighten the colour. Set the beans aside until needed later. In a pan over medium high heat, melt the vegan butter. Add the mushrooms, roasted garlic, salt and pepper and stir to combine. Cook for about 5-7 minutes, until the mushrooms begin to absorb colour, the onions are translucent and everything is fragrant. Sprinkle the flour over the mix and stir again throughly. Add the coconut milk and the vegetable broth and mix together vigorously to combine. Bring to a boil, then immediately lower again to medium heat, stirring, until the sauce begins to thicken. This might take up to five minutes, but just watch it. You can always thin the sauce a bit with some more vegetable broth. Once the sauce has thickened, taste test and season with more salt if necessary. Add the green beans in and stir to combine. 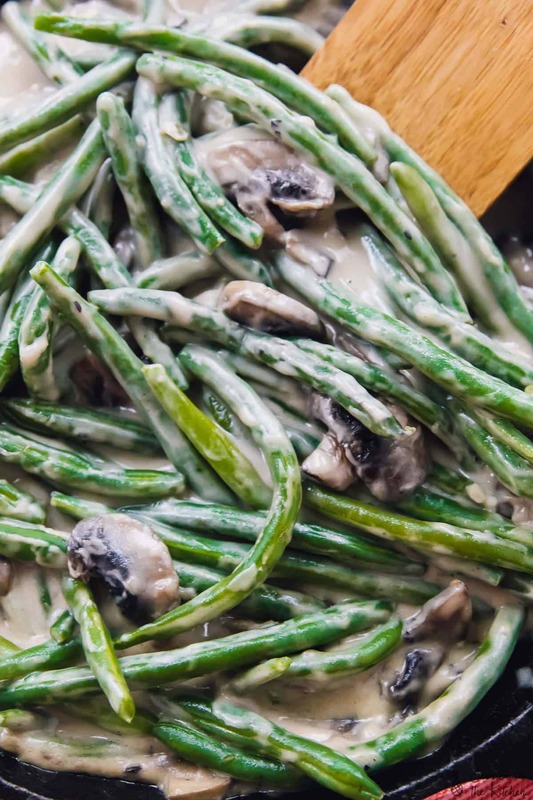 Allow the green beans to sit in the sauce for about 3 minutes to absorb the flavours. Remove from the heat. Top with onion rings when ready to serve and enjoy! If you try this Vegan Green Bean Casserole (From Scratch) please let me know in the comment section below, or tag me on instagram with the hashtag #jessicainthekitchen! For more exclusive recipes follow me on Instagram AND on Snapchat: jessinkitchen. Aww thank you so much!!! I’m so glad that you enjoyed! !